4×4=12 is the fifth studio album by the Canadian electronic music producer deadmau5, released internationally on 6 December 2010 by Virgin Records and a day later in the United States by Ultra Records and mau5trap Recordings. The album's title refers to a miscalculation made by deadmau5 on his Ustream channel, where he mistakenly said that his live setup of four banks of four "equals twelve". The album received a nomination at the 54th Grammy Awards for Best Dance/Electronica Album. The album was generally well received among music critics. Metacritic assigned it an average score of 66 out of 100, based on 13 reviews. Will Hermes of Rolling Stone touted the album writing, "4×4=12 is audacious, mixing generic house grooves with electric fare." Many reviewers praised the album for its universal appeal to a diverse audience. Annie Zaleski of Alternative Press wrote, "The collection is mostly instrumental tracks, ranging in style from insistent progressive house to watery techno…Without vocals to provide structure, 4×4=12's variety stems from deadmau5's sense of dynamics and pacing, as well as his diverse sonic influences". However, some critics seem to be wanting more from the artist whose man-behind-the-mask intrigue may be upstaging his albums. Allison Stewart of The Washington Post states, ""4×4" is a breakthrough album that doesn't feel like a breakthrough album. Not accessible or crowd-pleasing enough to court non-electronic music fans, not adventurous enough to satisfy die-hards, it pleases, but it rarely dazzles." Dave Simpson of The Guardian shared in Ms. Stewart's sentiments by noting, "Undoubtedly, the deadmau5 appeal hinges on the astonishing live show in which Zimmerman performs in a giant, illuminated mouse's head, but it wouldn't work without his tracks. His third production compilation again shows that he is a master at doing simple electro house music very well: humongous beats and basslines blend with straightforward chord progressions and, when interest may start to lag, sonic diversions." 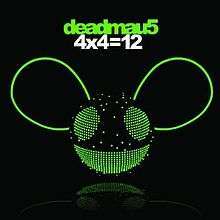 4×4=12 proved to become a breakthrough commercial success for deadmau5 when it became his first studio album to chart on the Billboard Top 200. It eventually peaked within the top fifty of the Billboard Top 200 and has spent over 100 weeks on the chart. It also narrowly missed the top spot of the Billboard Electronic albums, reaching number two. Internationally, the album was received warmly as well. It managed to chart within the top forty of various European nations, replicating and in many cases eclipsing the chart success of his previous efforts. In the United Kingdom, however, the album achieved a lower peak compared to his previous albums which all entered the top twenty, missing the top forty altogether. "Some Chords" was released as the first official single from the album on 3 May 2010 exclusively on Beatport. "Animal Rights", a collaboration with Wolfgang Gartner, was the second single from the album, released exclusively on Beatport on 6 September 2010 and followed by a wide release on 17 September 2010. The third single was "Sofi Needs a Ladder", released on 31 October 2010. It features vocals from SOFI and is the highest charting single in the UK, reaching #68. Deadmau5 was the house DJ at the 2010 MTV Video Music Award show hosted by Chelsea Handler in Los Angeles, California on 12 September. He opened the event with "Some Chords", then as the night progressed, he played "Sofi Needs a Ladder", "Cthulhu Sleeps", and "Animal Rights". Deadmau5 also performed at the 54th Grammy Awards in 2012. First he performed with Foo Fighters ("Rope" deadmau5 Remix) and then played "Raise Your Weapon". On the same day after the awards he revealed two new mau5heads. On iTunes, the international mixed CD version of the album has the track names "A City In Florida" as "City In Florida", "Cthulhu Sleeps" as "Cthulhu Steps" and "Raise Your Weapon" as "Raise Your Weapons". This has not been confirmed as intentional or unintentional. "Some Chords" was featured in the game The Sims 3 as well as on an episode of CSI: Crime Scene Investigation, where deadmau5 guest starred as himself. "A City in Florida" was featured in the 2011 video game Saints Row: The Third, appearing on the in-game radio station "97.6 K12 FM", primarily associated with the cyberpunk "Deckers" gang. "Sofi Needs a Ladder" was also featured on the soundtrack of The Hangover Part II and in the 2010 game Need for Speed: Hot Pursuit. ↑ Amar Toor (23 November 2010). "Deadmau5, '4x4=12' – 2010 New Album Preview". AOL Radio Blog. Retrieved 6 August 2011. 1 2 4×4=12 at Metacritic Retrieved 10 December 2011. ↑ Jeffries, David. "Deadmau5: 4x4=12 Review". Retrieved 9 December 2010. ↑ Morrow, Daniel. %5b%5bAltSounds%5d%5d "Deadmau6, '4x4=12' (Mau5trap/Virgin)". Retrieved 13 December 2010. ↑ Hermes, Will. "Deadmau6, '4x4=12'". Retrieved 6 November 2011. ↑ Kevin, Liedel. "Deadmau5: 4x4=12 – Music Review". Slant Magazine. Retrieved 4 December 2010. ↑ Sherburne, Philip. "Deadmau5, '4x4=12' (Ultra)". SPIN. Retrieved 30 November 2010. ↑ Lloyd, Nathan. "Deadmau5: '4X4=12' review". thinkofmusic.com. Retrieved 7 January 2011. ↑ Will Hermes (7 December 2010). "4x4=12 by Deadmau5 | Rolling Stone Music | Music Reviews". Rolling Stone. Retrieved 6 August 2011. ↑ “Animal Rights” (7 December 2010). "Alternative Press | Reviews | deadmau5 – 4x4=12". Altpress.com. Retrieved 6 August 2011. ↑ Stewart, Allison. "Click Track – Album review: Deadmau5, "4x4=12"". Blog.washingtonpost.com. Retrieved 6 August 2011. ↑ Dave Simpson (2 December 2010). "Deadmau5: 4x4=12 – review | Music". The Guardian. London. Retrieved 6 August 2011. ↑ 9/2/10 (16 August 2010). "Deadmau5 Named House Artist For 2010 MTV VMAs – Music, Celebrity, Artist News". MTV. Retrieved 6 August 2011. ↑ ARIA Report Issue 1111. Aria. Retrieved 15 February 2014. ↑ ARIA Report Issue 1085. Aria. Retrieved 15 February 2014. ↑ ultratop.be - Deadmau5 - 4x4=12 (in Dutch). Hung Medien. Retrieved 15 February 2914. ↑ "CANOE – JAM! Music SoundScan Charts". Jam.canoe.ca. Retrieved 30 December 2010. ↑ dutchcharts.nl - Deadmau5 - 4x4=12 (in Dutch). Hung Medien. Retrieved 15 February 2914. ↑ "Ireland Albums Top 75 (December 9, 2010) – Music Charts". Acharts.us. 9 December 2010. Retrieved 30 December 2010. ↑ swisscharts.com - Deadmau5 - 4x4=12 (in French). Hung Medien. Retrieved 15 February 2914. ↑ "Archived copy". Archived from the original on 2 May 2012. Retrieved 2012-01-25. ↑ "Archived copy". Archived from the original on 11 May 2011. Retrieved 2010-05-09.